Love checking in on design blogger, Jonathan, over at Happy Mundane. His blog is full of whimsy and makes me smile. I spotted his new Egg Chair and can just feel his excitement! (I am excited for him and I haven't even seen his space!) If you have an outdoor space, forget the folding chair and go big in your small space. 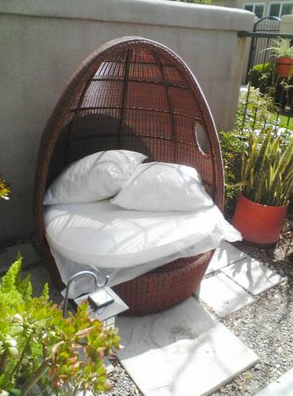 This Egg Chair is simply *lovely*! Check out Happy Mundane here and come visit Jonathan and the rest of us little bloggers at the Blog Out Loud event on June 4th at Patio Culture. It looks comfortable. I love your unique chair.